Hembree, finishing strongly down the centre of the track under jockey Irad Ortiz Jr., was up in time to score by a neck in Saturday’s Grade 2 Nearctic Stakes at Woodbine Racetrack. The $268,700 Nearctic, a six-furlong turf stakes for three-year-olds and upward, attracted a field of 11 and Hembree was one of three Mike Maker-trained horses in the field along with Hemp Hemp Hurray and Kitten’s Cat. Maker has a string at Woodbine for the first time this year and his assistant, Nolan Ramsey, has been the man in charge. “I got a good trip,” said Ortiz, who was recording his first win at Woodbine. Yorkton had cut out all the pace with a quarter in :22.31, a half in :45.18 and five furlongs in :56.76 with 8-5 favourite Lady Alexandra and Hemp Hemp Hurray, the lone thre-year-old in the field, in closest attendance. Hemp Hemp Hurray moved into second-place with a furlong to go as Lady Alexandra began to fade, with Hembree in high gear on the outside and Singandcryidubai making a late bid. Ortiz, however, felt he had the inside horses measured at this point. Yorkton just failed to last while in turn fending off an inside bid from Hemp Hemp Hurray, who ended another nose back in third. Singandcryindubai was a creditable fourth, another 1 1/4 lengths back. Bushrod, Kitten’s Cat, Holding Gold, Ikerrin Road, Lady Alexandra, Conquest Panthera and Sweet Little Man rounded out the order of finish. “I really like the horse,” said Ramsey, following Hembree’s victory. “Hemp Hemp Hurray may be a personal favourite, but this horse is all class, does everything right, and just makes my job very easy, so no surprise today. “He handles everything and is all class, so no surprises. Hembree, who was claimed for $50,000 at Aqueduct this April, was recording his first stakes win and coming off a sharp score under second-level allowance terms at Kentucky Downs. 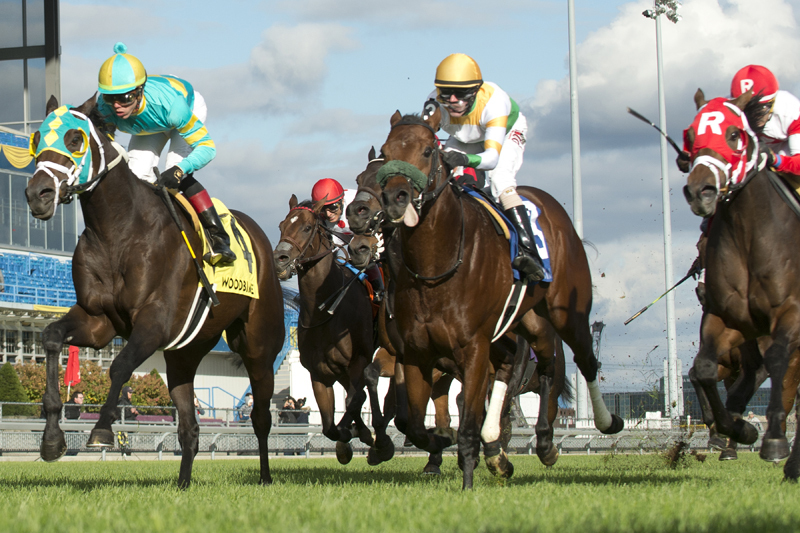 The Nearctic also was the final leg of Woodbine’s inaugural Turf Sprint Stakes series, which carried a $15,000 bonus to the winning owner and $10,000 for the winning trainer. The connections of Long On Value, winner of the six-furlong Highlander on July 1, and Mr Havercamp, hero of the seven-furlong Play the King on August 25, will share the bonus with the Hembree camp after each earned 10 points for their victories. Hembree, a Kentucky-bred four-year-old son of Proud Citizen owned by Three Diamonds Farm, returned $20, $8.80 and $6.20 and fronted an exacta worth $163.20 with the 6.90-1 Yorkton ($7.80, $6.50). Hemp Hemp Hurray ($8.30), an 11-1 chance, completed a $1 trifecta worth $588.30. Singandcryindubai, at 42-1, rounded out a robust $1 superfecta worth $15,764.45.